With the coming new edition of the DOOM board game, you can have a lot of fun tearing through the legions of hell with high end weaponry and explosives. But lets face it, even more fun than blowing up, perforating or incinerating hordes of demons is controlling them. The latest preview shows what the invader player does. Between summoning demons with rocket launchers, driving them into battle and augmenting them with even nastier event cards, I think it’s pretty clear who gets the better deal in this game. It’s not the Space Marines. Demons from hell are bad, but the opponents from the other fresh Fantasy Flight preview might be even worse. It was bad enough to have to fight aliens in XCOM, but the Evolution expansion gives the players human enemies to face off against, too. The secret EXALT organization seek to profit from the chaos created by the alien invasion. The two new invasion plans from the expansion have EXALT interfering with your work in different ways. Entirely new challenges await. A game of New Angeles is all about the people. Okay, that’s nonsense, a game of New Angeles is all about money. But your way to make money is through your assets. Most of those assets are people. Others just look like people, but might not be. Person or android, the assets all have abilities powerful enough that which ones you have will determine your strategy. All of them are unique, so your options will differ a lot from one game to another. A new preview post introduces you to some of your potential future employees. New on Kickstarter by Eagle-Gryphon Games is the English edition of Isaribi, a light strategy game by Japanese designer Hisashi Hayashi (Yokohama, Trains,…). Isaribi is not a game of building an empire, corporate or otherwise. The players are simple fishermen, going out in their boats everyday to bring home clams, prawns and fish to sell at the market. It’s a small market, though, and coming too late might mean you don’t get to sell your catch. Besides this matter of time management, managing your income and invest in the most useful upgrades is important. Sometimes, better sails to move faster will be the way to go. Other times you’ll want that smokehouse to keep seafood for the next round. The game is small and quick to learn, but gives you enough options to try different approaches. 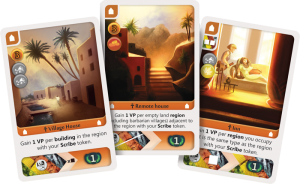 We mentioned before that Deus: Egypt will come with new decks for all categories of cards in Deus. When playing with the expansion, you select any number of original decks to replace with their expansion equivalent. You can play mostly regular Deus but with the Military cards from Egypt, for instance. Speaking of Military cards, you can see some of the new ones in a new preview post, together with Civil and Temple cards. All of them seem to have more complex abilities than the base game card, ready to be cornerstones in new strategies. Omen: A Reign of War, a two player card game by Small Box Games, has many fans for its quick gameplay, its many different combos to use cards in and, not least, it’s beautiful artwork. If you simply want more of all of the above, then the Kickstarter for Omen: Edge of the Aegean is what you’re looking for. The new standalone game uses the same rules as A Reign of War, but with new twists, brings fresh and powerful card combos and comes with new amazing art. A worthy second part in all respects. We’ve already heard a lot about the struggle over mythological Ireland in Inis. One aspect that was left out so far was what happens when you move your tribe into a region that is already inhabited. I had somehow assumed that it would be a simple majority thing where the larger force wins, but a clash is more interactive than that. In quick rounds, players involved in a clash may attack or play cards. The target of an attack must remove one of their people or discard a card. That sounds much better than “the larger army wins”, there are tactical choices to be made. And peace is also an option, even after a clash has begun. That’s rare enough in games that it deserves a mention. Richard Breese’s Key series (Keythedral, Keyflower,…) will continue in 2017 with Keyper, a new worker placement game with some entirely new ideas. First, there are the foldable country boards. Each board has three connected pieces, and depending how you fold them different spaces will be visible. But that’s just material, the game mechanics are equally innovative. In the worker placement you can follow another player’s move, on their turn still, with your own worker, bringing benefits to both players. But it’s not a cooperative game, just a game where cooperating will sometimes benefit you. The cooperation ends when the time comes to reclaim workers. A player can claim one of the country boards as their own each round, and all workers on that board will be theirs for the next round. That means not only a different number of workers but also different colors, but we don’t know yet what the worker colors will mean. The Kickstarter is nominally for the Keyper Character Edition, a special edition where all meeples – apologies, keyples – will be Meeple Source’s beautiful painted meeple. But there is an option to get the standard edition as well. 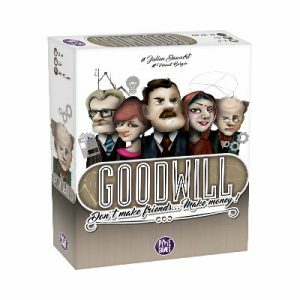 Goodwill, a lightish investment game by Pixie Games, is currently crowdfunding on Spieleschmiede. Up to six players invest in three companies with the obvious goal to have the most valuable portfolio at the end of the game. How they get there, however, is a long way from a dry, economic game. Every round each player gets secret information of random events that might influence stock prices, together with a probability for that event. Then everyone gets the chance to trade stocks with other players and only after that is finished all possible events are revealed. Of all those events, only the three with the highest probabilities actually happen. If you did a clever risk assessment of your portfolio, then you’re a bit richer now. If not, then not. It sounds like a lot of luck, but I think risk management is the better word here, and I like games with risk management. This week’s featured photo is another one that hardly needs an explanation: the Grand Canyon National Park in Arizona, USA. Proof that rock can be beautiful without putting as much as frozen water on top. The photo was taken by E Palen and shared with a CC-BY license. Thank you for sharing, E!